By the second half of the 19th century, scientists were beginning to develop a better understanding of the overall function of the nervous system. Discoveries like Paul Broca's identification of Broca's area and Fritsch and Hitzig's description of the motor cortex, for example, had led researchers to a deeper appreciation of the functional specialization of different parts of the brain. What was still missing by the 1870s, however, was an awareness of some of the most fundamental information about the basic building blocks of the nervous system: neurons. In fact, the word neuron (along with the terms axon, dendrite, and synapse) would not be introduced until the 1890s, and at the middle of the 19th century there was some debate about whether the brain was even made up of distinct cells like other tissues in the body. This was because when one viewed brain tissue under a microscope, nerve cells appeared to have many extensions that stretched out to other cell bodies, seeming to make contact with them. In this way, the brain looked as if it consisted of a collection of uninterrupted processes that formed an expansive net of cellular entities. This view of the structure of the brain came to be called reticular theory, as the word reticulum is Latin for "net." The main obstacle that prevented researchers from being able to describe the true structure of neurons was the lack of a stain that allowed for the clear differentiation of neurons under the microscope. Because cells are not distinctly colored like they often are in textbooks, their clear borders are difficult to discern against a similarly colorless fluid background (even under the microscope). Microscopists must rely on dyes or stains, which selectively color cells or individual components of cells so they stand out and are able to clearly be seen. Before the 1870s, the most widely used stain in brain science was a substance called carmine, a reddish stain that could be obtained from certain insect species (it is still used today as a coloring agent in a variety of products ranging from cosmetics to yogurt). Carmine was recognized as a staining agent in the 1850s. Its discovery was a major breakthrough, as prior to its widespread use staining was not even a regular practice nor was its utility fully appreciated. The carmine stain, however, still did not allow brain scientists to attain a perfectly clear picture of neurons, instead leading to the view that supported reticular theory as discussed above. 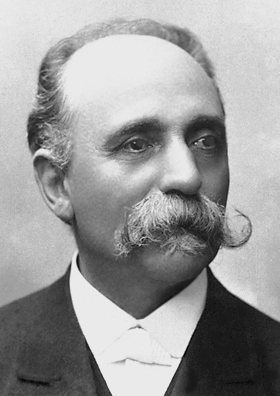 This was the context when Camillo Golgi made his contributions to the field in the 1870s. Golgi was a thirty-year old physician working at a small, little-known hospital in northern Italy. He did not have the benefit of using the laboratory facilities of a large research institution. Instead, he created a makeshift laboratory in a kitchen of the hospital. The laboratory consisted of not much more than his microscope, which he mostly used in the evening by candlelight. It was in that hospital kitchen that Golgi developed a new method of staining that would revolutionize the way people looked at the brain. The stain involved soaking cells in a solution of silver nitrate, and although Golgi was not the first to attempt to stain cells with silver, his method was a tremendous improvement over past efforts. 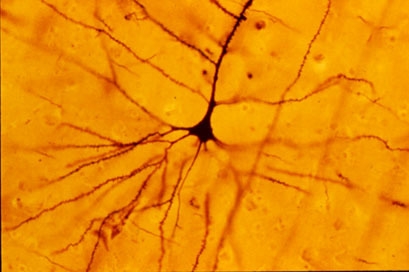 The silver staining method caused neurons to appear dark against a yellow background (for this Golgi initially called the method the "black reaction"), but the essential feature of the stain for making it useful in visualizing neurons was that it only caused about 3% of the neurons in a tissue sample to be darkened. This was important because if all neurons were stained, the abundance of cells in any sample would cause the whole sample to appear black. Due to its selectivity, the silver stain allowed for the visualization of a selection of neurons in such detail as had never been possible before. Golgi used his new stain to make a number of important observations about the nervous system. He provided more detailed descriptions of neurons, including the first good descriptions of axon collaterals, or branches that extend off of the main processes of axons. He described two types of neurons in the brain, one that has long a long axon that can stretch from the grey matter of the brain to other parts of the brain or nervous system, and another that has a short axon. These neurons have since been named Golgi I and Golgi II cells, respectively. He detailed ways in which glial cells can be differentiated from neurons and described the structure of the cortex, corpus callosum, and spinal cord. He discovered sensory receptors in muscle that detect muscle tension; these are now known as Golgi tendon organs. And of course he was the first to describe in detail the protein- and lipid-packaging cellular organelle now called the Golgi apparatus. Despite all of Golgi's achievements, his contribution of the silver stain may have been the most significant, as it allowed later researchers to appreciate the true structure of neurons for the first time. Golgi's stain (with some refinement) would be used by neuroscientists like Santiago Ramon y Cajal to prove that neurons did not fuse together to form a net, and instead were independent of one another (just like other cells in the body); Cajal's observations on the structure and organization of neurons would soon come to be known as neuron doctrine, and it would supplant reticular theory in the minds of most of the scientific community. Golgi and Cajal would share the 1906 Nobel Prize in Physiology or Medicine for their important contributions to neuroscience. Although Golgi's stain had helped Cajal to disprove reticular theory, Golgi refused to accept the evidence that suggested neurons were independent of one another. In his Nobel Prize acceptance speech, Golgi railed against the neuron doctrine, shocking much of the audience to whom the evidence in support of it was distinctly clear. Even though he was incredibly stubborn on this point, however, Golgi's obstinance does not overshadow the significant contributions he made to neuroscience and biology as a whole. Finger S. Minds Behind the Brain. New York, NY: Oxford University Press; 2000.